Ludington is a very popular destination, especially with those arriving by boat. The city has two marinas to serve transient boaters, separated by the beautiful Waterfront Park. The north side of the Ludington Municipal Marina has a 900 foot transient/day dock seawall, allowing space for up to 22 transient boaters to tie up. Water depth at the marina is about seven feet at the entrance. There is a $5.00 fee for day dockage up to four hours. This is convenient for boaters making a quick stop in Ludington to visit the shops, restaurants, and parks in the downtown area. 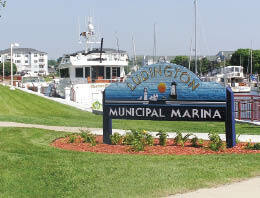 During the summer months, the Ludington Municipal Marina is open 7 days a week from 6am-10pm. It can accommodate boats up to 125 feet in length, and offers 174 slips (86 seasonal, 88 transient) with both floating and permanent pier docks available. You'll find 30 & 50 amp power, plus water and cable TV hook-ups at the docks. Some amenities the Marina offers are a fish cleaning station, two restroom and shower buildings, laundry and dishwashing facilities, free Wi-Fi, public shelter with grills, and a dog walking area. Ludington is the number one port for Salmon and Trout fishing on Lake Michigan. According to the DNR fishing reports, more fish are caught in Ludington per angler hour than anywhere else in the state. Charter boat fishing is big business in Ludington, and many Lake Michigan charter boats are docked at the marina, including Lie-a-lot Charters, a full time, full service charter boat operation. Captain Mike's goal is to provide everyone with a quality fishing experience that will be remembered for a lifetime. Whether you're a first-time fisherperson or an experienced angler the Captain will customize your fishing trip around your needs. Opened in 1999, Harbor View is a deep water marina that has 160 slips for boats up to 60 feet and wall ties that can accommodate vessels up to 100 feet. Harbor View Marina has a 7,000 foot clubhouse for its guests that features a fireplace, library, Ship's Store, exercise room, showers, and laundry facilities. They also have a pool and spa, Wi-Fi, grills, picnic tables, fish cleaning station, and dog run. 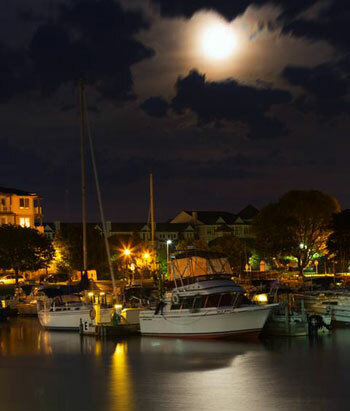 Pere Pointe Village off Washington Avenue overlooks Pere Marquette Lake and is a deep water marina with a state-of-the-art floating dock system. It offers an in-out launch for boats up to 45 feet. The beautiful clubhouse offers a fireplace, cable TV, internet, shower and restroom facilities. A social membership is available for pool privileges. Pere Pointe is just down the street from charter fishing captains, Copeyon Park, and is very close to downtown Ludington shops and restaurants.